ETT is proud to announce that Nancy Dye, a member at Wexford Public School (Hearing Itinerant Department), has been awarded the OTIP Teaching Award for Excellence in the Elementary Teaching category. 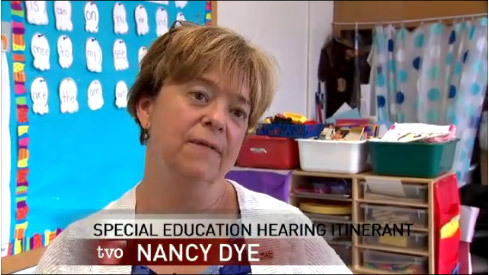 A teacher for 25 years, Nancy has devoted her career to improving education for early years and preschool deaf and hard of hearing students. Nancy developed a preschool program for deaf and hard of hearing students from the ground up – the space, the staff and the materials. This program started with 8 pre-schoolers and has grown to 14. She also created the Parent Lending Library which provides support materials to assist parents in all aspects of their child’s learning. She started the Captioned Library of closed captioned materials which is used extensively by teachers across the board. Parents, administration and colleagues supported Nancy’s nomination – a true indication of her contributions to our profession. The annual OTIP Teaching Awards, which are sponsored by OTIP (Ontario Teachers Insurance Plan) and OTF (Ontario Teachers’ Federation), recognize the outstanding contributions of teachers to their schools and students. Winning teachers are hosted at a fall awards ceremony in Toronto where they are presented with a personal award of $1,000 and a Certificate of Recognition. Their schools are recognized as well with a $1,000 prize and a Certificate of Recognition.